The world-famous Red Arrows will perform in Qatar in September as part of a Middle East tour, the British Ministry of Defence has announced. Their visit comes amid efforts to strengthen the UK’s ties with nations across the Gulf. The pilots last wowed crowds in Qatar with daring maneuvers and red, white and blue plumes of smoke in 2013. Crowds gathered along the Corniche and at office windows in West Bay to witness the free show, which was followed by a demonstration of BAE’s Typhoon. At that time, the UK had been trying to sell the fighter jets to Qatar’s government. In addition to Qatar, the Royal Air Force Red Arrows will perform in Saudi Arabia, Bahrain, the UAE, Kuwait, Oman and Jordan. In a statement, Defense Secretary Sir Michael Fallon said the display will help show the UK is “open for business” around the world. Exact dates for the Gulf visits have yet to be announced. 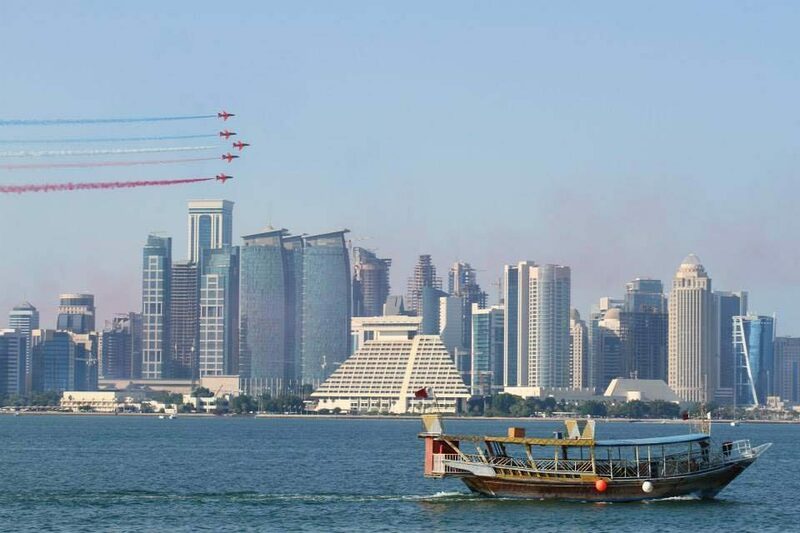 For nearly half an hour this afternoon, Qatar residents looked to the sky to watch a thundering air show performance by the Red Arrows. The British aerobatic group, comprised of nine British Royal Air Force pilots, appeared to wow crowds with daring maneuvers, and were trailed by red, white and blue plumes of smoke. @StuartEvans79 @dohanews I was in my room and I thought the country was under attack when I heard the noise! @damianradcliffe From the shrieks and ahhhhs in our offices you would think something else was going on lol. @acepilotkhan @dohanews FYI Doha airport is closed! All flights on hold until you guys finish having fun. Tweet from the #Dubai runway!